My siblings had a discussion recently that brought up a family secret I've been wondering about all my life. It involves my family and another family and why our two families spent time together growing up. At the center of the secret is my mother and something that happened before my parents ever met. We know the part of the secret that happened before my parents met. While "scandalous" at the time, it's nothing you'd even blink at today. But the part we don't know is why that occurrence turned into an enduring relationship between us and this other family. And the "why" of all of it, I suspect, would reveal aspects of both my parents' personalities that would surprise me. We'll probably never know the answer, because everyone involved likely brought the secret to their graves and they've all been dead for decades. I knew my mother for 21 years and my father for 25. While most people end up knowing their parents longer, I think the amount of time I knew mine allowed me to pretty much know who they were—their morals, their positions on certain issues and whatnot. And the only logical explanations I could come up with as to the dynamics of this situation just don't make sense in the context of what I know. And, oddly, this has been a question mark in my head going back to my early childhood when I didn't even have the vocabulary or life knowledge to fully form it in my head. I've just always a niggling that something about this situation just doesn't make sense. Because I lost my mother so young, there were so many things I never got to ask her. During the last four years of her life, I was in college many states away, so that didn't help the situation. One of my sisters takes these kinds of queries and writes up autobiographical information so her kids won't be left wondering after she dies. I think that's kind of a cool practice, because no matter how old you are when your mother dies, as you age you think of questions to ask that didn't occur to you when you were younger. But back to secrets. It doesn't surprise me that my mother had secrets. For the 1950s, my parents married late in life and my mother had been married before. 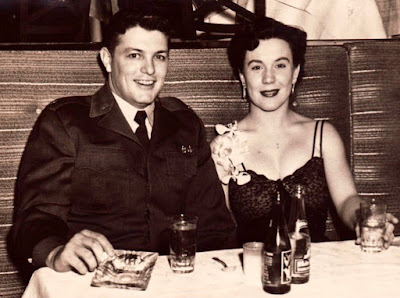 She married her first husband to get herself out of WWII England, where her life was pretty hard. So she lived a lot of life and was a single lady for a long time before she married my dad. Then, once she married him, her life took a dramatic turn. She plopped out six kids in eight years. And if we, say, ate all the ice cream in the house, she would complain "why can't I have something for myself, just once?" Well, she clearly had secrets to herself...haha. We know very little about her first 28 years or so of life, and what we do is really interesting. I can only imagine all the gems she kept to herself. As far as big things go in my own life, for every secret I have, there's another person out there who knows the secret. But nobody knows all of them. And though I've never had a husband or child to "share all my secrets with", I'm not sure I ever would regardless. Like my mom, I like having some things just for myself. And I believe, especially in a day and age where our every meal and mood is put on display for others to see, some things are meant to be kept just for ourselves. So can we ever really know a person? And does anyone ever leave this earth without taking a few secrets with them? As I said about my parent's secret in particular, it likely reveals a side of them that I had never seen in all the time I knew them—and my parents were very consistent, predictable, measured sorts of people. So you just never really know. Also, we tend to think of our parents as just that. We sometimes forget they are men and women who once had dreams that never manifested, hijinks that showed poor judgment, gaffes they'd rather not relate, crushes that they longed for and relationships that preceded their marriage. I never got the chance to know my mother woman-to-woman. That will probably remain the most epic disappointment of my life. If I had any advice for those whose mothers are still alive and able, it would be to spend time digging deeper into their personal lore. We know them as mothers, but that's just one aspect of who they are. And once they're gone, you'll wish you knew them as humans, women, professionals, dreamers and otherwise. I'm glad I know as much as I do I know about my mother. She was really a fascinating woman with a compelling inner life I only saw rich, intensely colored glimpses of. Many people, for one reason or another, know far less about their own mothers. So while it drives me batty that I'll never know the story behind this one bit of family lore, I'm grateful for what I have. And I'm glad my mom can look down upon the children that ate all the ice cream during the last half of her life (not to mention my dad who rarely ever took a minute to himself) and know she managed to keep something for herself.